This is Queer Voices on KPFT and this segment is called Queer Music Heritage. I'm JD Doyle and I'm starting out this show by featuring several lesbian acts from the 70's. And I'm going to finish up with a special interview with Lucie Blue Tremblay, to whom fans of women's music will need no introduction. Opening the show is a song called "Talkin'" by the duo Jade & Sarsaparilla. That was also the title of their only album, released in 1976. Their names were really Janet Hood and Linda Langford. I found it interesting that while the album's songs were definitely directed toward women, with music written by Janet Hood, the lyrics were written by a man, a gay songwriter named Bill Russell. Russell and Janet Hood were writing partners well before Janet met Linda Langford and the two of them formed Jade & Sarsapirilla. And as a footnote, while I know of no other recordings by either of them as performers, Janet Hood, continuing to write with Bill Russell, wrote a very successful AIDS musical in the late 80s, called "Elegies for Angels, Punks and Raging Queens." Oh, and a bit of trivia about their name, neither one of them was Jade or Sarsapirilla, that was just the name of the duo. One of the earliest albums with a lesbian presence by a group came out in 1978, and the name of the album was "Quiet Thunder." The name of the group was, bear with me, Izquierda, which in Spanish means left. Lead vocals were by Naomi Littlebear Martinez, and in a way, if you're a long time listener, you've heard her on Queer Music Heritage before. When I did my tribute show to Maxine Feldman I played Maxine's song "Angry Atthis." 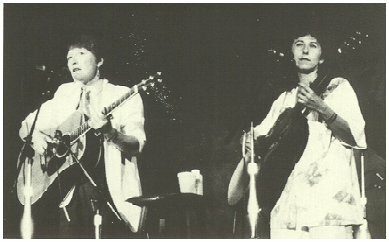 That 45 rpm record was the first openly lesbian recording, and singing backups on it was a duo called Sisterhood, who were Robin Flower and Naomi Littlebear. Anyway, Naomi Littlebear later became known as Naomi Littlebear Morena, who for decades has been a prominent writer, speaker and social activist. One of her more famous quotes is that to her "complacency is a far more dangerous attitude than outrage." But that's enough talk. From the group Izquierda let's enjoy their song "Special Friend." One further note about that group, another of its members, Kristan Aspen, also went further with her music, but in a more classical vein, as a musician and composer, as part of the duo Musica Femina, with her partner Janna MacAuslan. 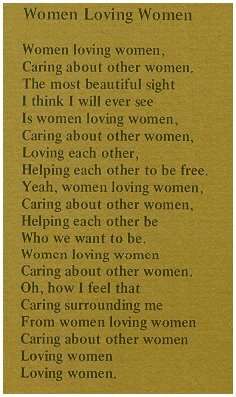 Up next are two short songs by lesbian feminist songwriter Carole Etzler. 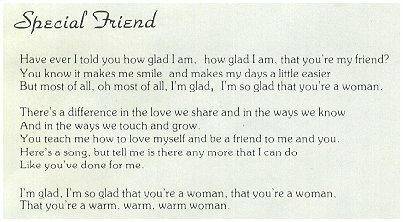 The first one is from her 1976 album "Sometimes I Wish" and is called "Women Loving Women." And the second song I played by Carole Etzler was called "Before I Even Spoke" and it came out in 1978 on her album "Womanriver Flowing On." Many Houston listeners may be more interested to know that singing backups on that last song was Carolyn Mobley, who later became Associate Pastor of the MCC Church in Houston. I've scanned some photos of her from the album liner notes, so you'll be able to see what she looked like some 28 years ago. And you'll be able to do that at my website. If you visit it while you're listening you can see the playlist and follow along, while looking at photos of the artists and recordings. I've always considered our music history as a visual as well as an audio experience. Again, that's at www.queermusicheritage.com, Also, for more very queer programming, please listen to After Hours with Jimmy Carper, every Friday night/Saturday morning from 1 to 4 am, on KPFT, it's Queer Radio, with attitude. I've longed loved the music of Lucie Blue Tremblay. But last November was the first chance I've had to actually see her perform. She was in Houston for a very special reason, doing a concert and fundraiser for The Breast Exam Project, and she'll tell us about that a little later. She's French-Canadian and has been writing and performing her music in the US and Canada since 1986. I think her music is the kind that just nestles in your heart, and another reason I appreciate her music is that right from her first album she's not shied away from singing about gay & lesbian topics. Her sixth and latest CD is called "It's Got To Be About Love," and is almost like a greatest hits album. It's got some of her most favorite songs, and some of them are presented in a concert setting. 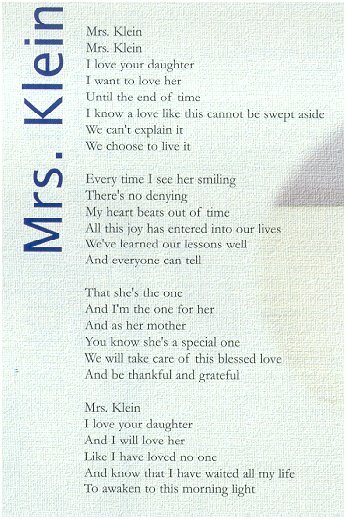 when you open the CD insert it's like a wedding album. 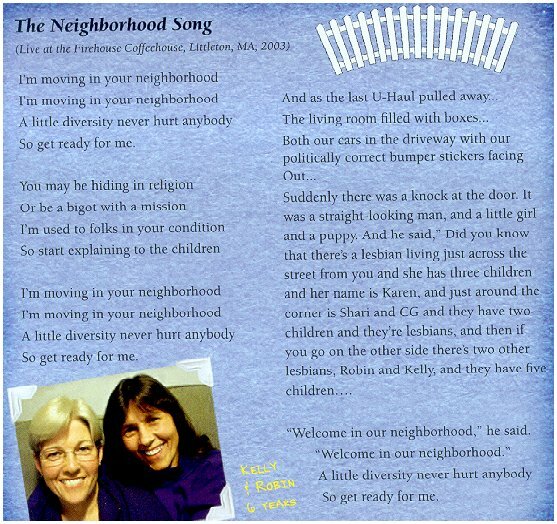 I particularly like "The Neighborhood Song"
well, the barriers come down, and realize that it's all about love. those are going to be the hit songs, like in mainstream music, you look at that and go, "Okay, well, these are the hit songs, and these are kind of the dead songs." And I don't really produce that way. So I don't make music from a commercial point of view, which is probably why I'm an independent, and I like it that way. But I think that every song is different. I have sometimes some songs that are like favorites, and then as I'm going through something else in my life, other songs become the favorite songs. But they all have purpose, and I can't really point to one in specific. The only think I could tell you is that there's one song that keeps coming back over and over again in my career from my audiences, and that's "So Lucky." 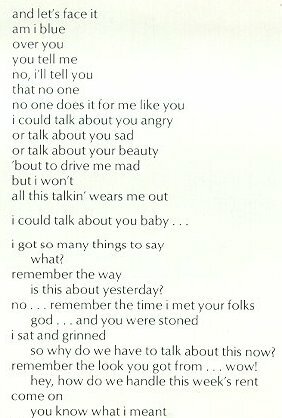 That would be like the song everybody asks over and over again. So that's one of the reasons why I re-recorded the newer version, the mature version, cause that was in 1986. 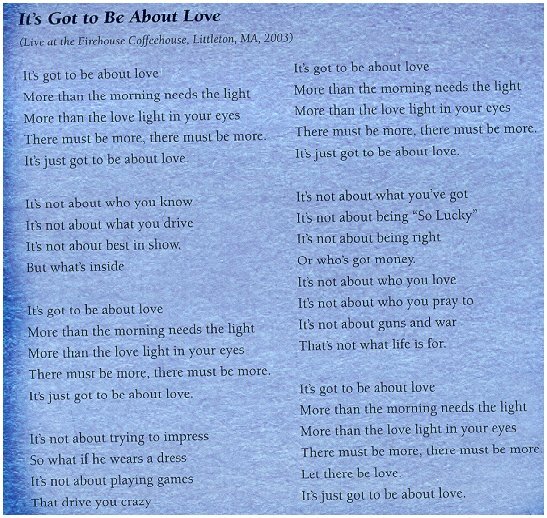 So I just recorded "So Lucky" on the new CD called "It's Got To Be About Love." But besides that I really have to say that they all stand on their own and they all have a purpose. Tell me about the song "So Lucky"
Well, I guess "So Lucky" was a song that I wrote not too long into my coming out process, my own personal coming out process, and I wrote it with all the verses and the way the bridges are in probably ten minutes, yeah, cause it took a while to get some things down. But I pretty much spit it out and it said it all. I didn't have to go back and rewrite words, or anything like that, I pretty much wrote it in ten minutes, and I've been singing the same ten minutes of writing every since. Did you release it on a 45? I released it on a 45 in 1982, and I really wanted to make an album and I didn't really know how to do it, how to do that. So my first attempt was, well, let's do a 45, so my sister at that point said, well, you know we'll go in the studio and we'll do it and lent me my first little amount of money to make a 45. So I did it and I learned it out, you know, it was my first experience. Everybody was telling me what to do, which was fine, cause I didn't know what I was doing. But it didn't take long for me to get that I had to know more. My first experience with a lot of guys who were like, "Okay, we'll do this song for you, we'll arrange it, we'll do this, that." And so when it came out it was like I was really proud of it, and sold it for a little while, and then we finally made the first album, and got a chance to redo "So Lucky" the way I really wanted to do it. What was on the other side of it? it was supposed to be side 1, and "The Freak" was going to be side 2, and then I didn't like the 1 and 2, so I did a face A and face B instead, just to be different. And that song hasn't appeared on an album. feel to it. I knew I could never do that rendition in concert, so why bother, it was too much. So many of your songs are about being in love, and they are like a gift to those who are. That wasn't a question, but it just came to me while preparing for this interview. The song "So Lucky" was Lucie's first 45 and was on her first album, which was simply called "Lucie Blue Tremblay," from 1986. I'm going to stick with that album for my next question. From your first album, please tell me about the song "Mademoiselle"
to see women building stages, and climbing up in the lighting towers and doing sound and incredible saxophone players and drummers and, you know, having music inborn inside me, I was like I couldn't believe all that I was seeing, so I was on overwhelm most of the time. So I wrote that song on overwhelm. Some of the lyrics were very specific. 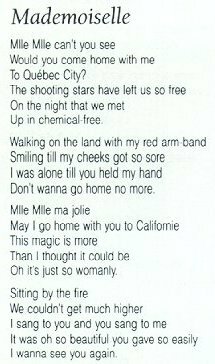 You almost have to know about a festival to understand the lyrics, like walking around in Chemical Free, and red arm bands. Even before she recorded her first album she appeared on the album "Michigan Live '85" which was recorded at the 10th annual Michigan Womyn's Music Festival. 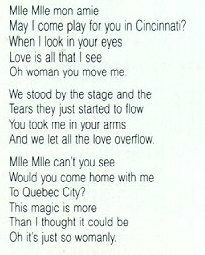 On the album "Michigan Live '85" you sang a gorgeous duet with Ferron, would you tell me about it. it was my first time I was invited to perform at the Michigan Festival that year. And so I was playing at the Day Stage, and I knew Ferron, from before and I had translated her song in French, and had done a French adaptation, and had recorded it. It was called in English, "Ain't Life a Brook." And so, you know, when we saw each other and talking with her manager and partner at the time, and thought you know, it would be nice to this in French and English. And so we did that on the Main Stage, and it was quite an experience. 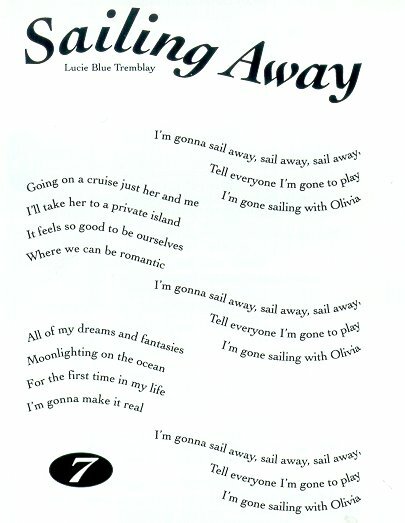 Lucie's first three albums were on the Olivia label, the premier label of the women's music movement, and the from the third one, "Transformations," from 1992, it seemed like the song "Sailing Away" could have been written for the Olivia Cruise Lines. Yeah, yeah. I wasn't commissioned to do it, but I was very excited about what Olivia was doing, and I was actually flying to one of their cruises and I was inspired to write a song, I wrote it in the plane. Before we landed it was written. You had some notable help on that song. I did, I sent Tret (Fure) some tapes and she added some guitar and vocals and Cris Williamson did some vocals on there, and I did my first attempt at drum programming, and I had a good time. 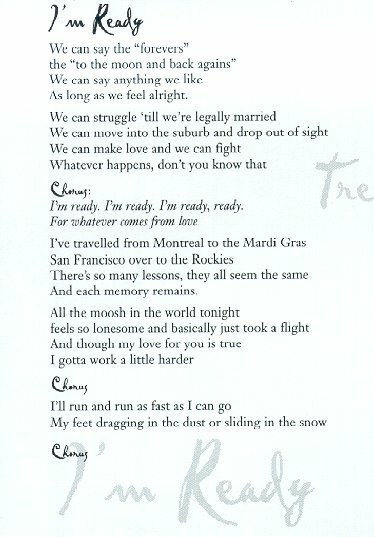 From that same album, could you talk about the song "If You've Ever Loved"
you know, swelled up in tears. And after the show I went to her and I asked her if there was any chance that I could play that song in concert to share it with people, cause it's just such a beautiful song. And she said, "Well, I don't know, cause I'm going to record it soon, and so I don't know." And I said, "I can really take this song to many people. I promise I'll play it in so many places. 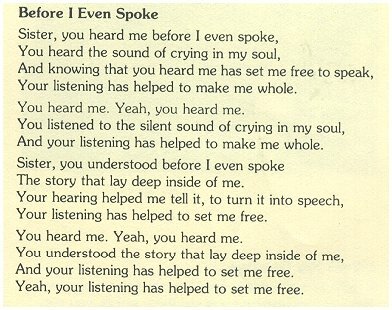 It will be heard." 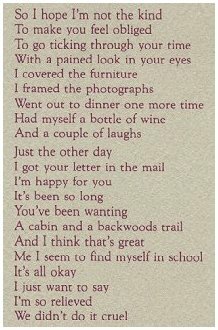 Her friends talked to her afterwards, and they told her that she should say yes, and, she was good enough to do that and she sent me a Fedex package with the lyrics, and then I went and I did my own version of it. And so if you listen to the string section at the very beginning, it's actually a string section that I arranged, to "I Hope They Call Me On A Mission," which is a Mormon church song, and since it talks about Salt Lake City I wanted it to start off in a tabernacle environment. 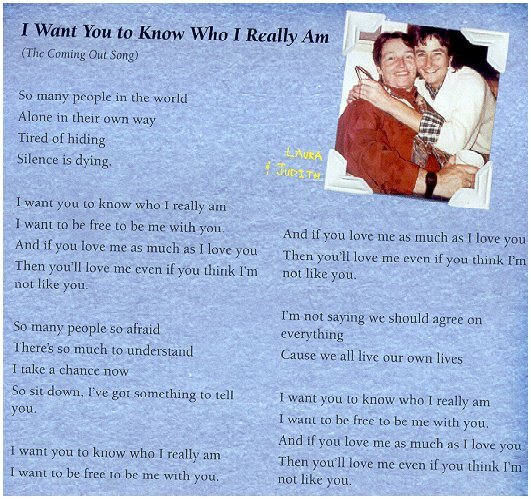 I would love to hear about the song "I Want You to Know Who I Really Am"
they can just put it in the mail. They don't have to deal with anything, and, have some blank lines in the cassette liner so you can write a note, to the person you're sending it to, and they had some 1-800 numbers as well, for the National Coming Out Day people, and also the Washington DC address for PFLAG. And I just thought, this would be a little helpful tool. And I made a bunch of them. I probably made like a thousand of them, and I sold them, and people just started, you know, just mailing those out. It was very cool. 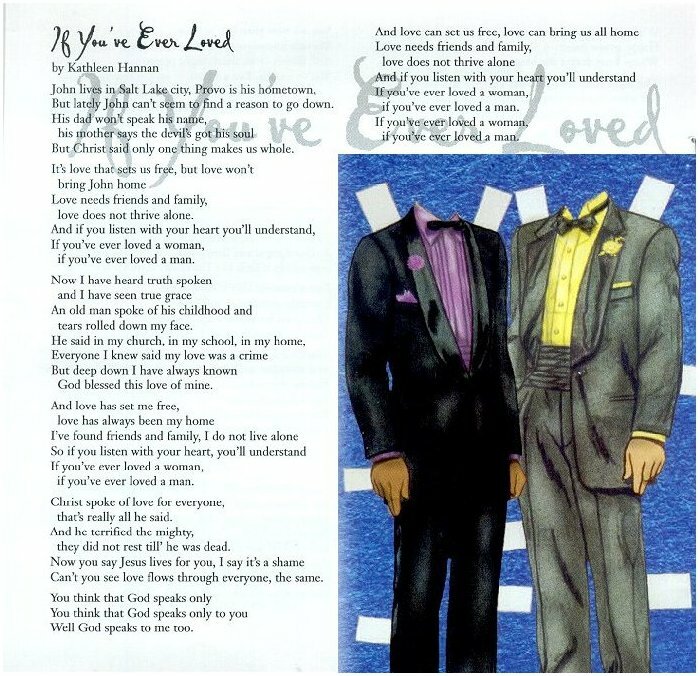 It was a very different arrangement than the one on this album, and the reason is when I wrote this song I actually wrote, "and if you love me as much as I love you, then you'll love me even if I'm not like you." That was the thinking in those years, when I wrote it. When I made this arrangement, which is more of a hip hop, kind of a bit of a groove song to it, it was a really good opportunity for me to change the lyrics to: "and if you love me as much as I love you, then you'll love me even if you think I'm not like you." So it was a really good opportunity to do that, and I really like that song. How do you think your music's changed over the course of your six albums? a more useful person. The music isn't so much about me. You know at the beginning, my first album, I had all these songs and I was really excited, cause I got to make a CD, or an album, and it was more me-oriented. And I think through the years I've matured. I've realized how little I am in the big picture, and that makes such a difference in how I write and how I treat people and how I sing to people. And that's the big difference, and so I feel really good about that. At this point I'm going to share with you a song I didn't get a chance to ask Lucie about, but I really like it. It was originally from her 2001 album "Because of You," but this is the live version from her latest album, with the intro, and is called "Mrs. Klein." Would you please tell me about the Breast Exam Project? and the reason why I say that is men are now being more diagnosed with breast cancer, and a lot of men don't know this. So, we're actually producing a DVD with the self-breast exam, and it's going to have the 12 sets of breast, of real breasts on video, so people can see how to do it. And it's a little bit like the ABC, you know, how you sang the ABC, and that's how you learned that A, you know, comes before B, and that D comes after C, because when you sang it, that was the order, so you knew the order. I feel that if I sing the directions to the self-breast exam, then you'll always start the same way and finish on the same breast, every time. But by doing that, from month to month, if there's any changes, or if you notice a lump or anything, you'll notice right away because you started to do your breast exam exactly at the same place as you did the month before. So it's a package with information as well, interviews with health care professionals and interviews with men and women who have had breast cancer, interviews with people who found lumps and they were benign. And it's basically an informational package. It's going to be available on our website as well as on DVD. And we're going to go for the next three years to different sports events, and music events, and we're going to be giving away the DVD everywhere we go. I'm down to the last song, but before I get to it I want to thank you all for listening, and I want to especially thank Lucie Blue Tremblay for the wonderful interview. And as I had expected, the interview was so good that I could not fit all of into the radio version this show, so my internet listeners can hear an extended version with a lot more comments and additional music. That of course can be found at www.queermusicheritage.com. And, as always if you have questions or comments about any of the music I've featured, please write me. This is JD Doyle for Queer Voices on KPFT Houston. 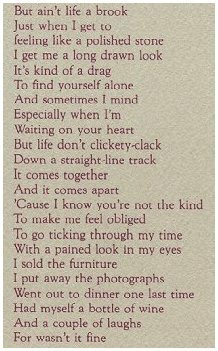 Lucie, please tell us about your latest album's title track, "It's Got To Be About Love"
at first I thought people are going to hear it and "It's Got To Be About Love,"
.oh, how many parties you have. It's not about any of that. It's really about love. That's really all it is. And it was just really important to put it out and I figured the people that can relate will relate to this song.